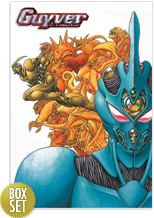 This "ultimate" Guyver collection arrives on DVD courtesy of Madman which is one of the most cleverly scripted anime series to date that is as far away from the stereotypical Manga characters that not only features an engaging story but some of the best animated action ever. Set in the distant future where the world is controlled by a sinister brotherhood called the Chronos Corporation, mankind is enslaved to their wishes. Although some of mankind still attempts to overthrow the Chronos Corporation, their efforts are generally a futile attempt. Fortunately for Earth, fate has other plans for mankind and during a mysterious explosion near a high school, Sho Fukamachi stumbles upon a technological advanced organic suit of armor that is known as "Guyver". As the Chronos Corporation attempts to reclaim their greatest weapon, Sho soon finds himself in a game of cat and mouse as the corporation unleashes an almost unending line of enemies to retrieve this powerful artifact. Forced to call the powers of the armour, Sho's life is soon changed as he becomes the embodiment of Guyver in some spectacular results. Easily one of the best anime TV series of all time, Guyver contains a healthy dose of drama, action, romance and even a touch of comedy as the viewer is drawn into this futuristic world with monsters and robotics. Although the series revolves around Sho and his friends, the creators have ensured that the enemies side of the tale is also told and it's great to see the action and storyline heat up as the series progresses. Things become more complicated when a variety of different Guyver suits make themselves known which offers a great showdown at the Chronos Headquarters. Without spoiling the story any further, it's a classic tale of good versus evil, although the lines are sometimes blurred with our main hero who needs to make the hard choices. I must admit that the evolution of "Guyver" in the series is brilliant and the ending of this compilation adds to the brilliance of this engaging anime series. Gripping from start to finish! Presented in an aspect ratio of 16:9 widescreen, this is a truly outstanding presentation with sharp images and vibrant colours. Of course the star of the series is the digital animation which has been flawlessly integrated with the main animation. Best of all, the series contains a Dolby Digital 5.1 mix which is exceptionally clear and compliments both the story and video nicely. The action scenes are quite well balanced and you don't need to adjust the volume as like some other anime series. Definitely a must have for lovers of quality TV series... not just animation!